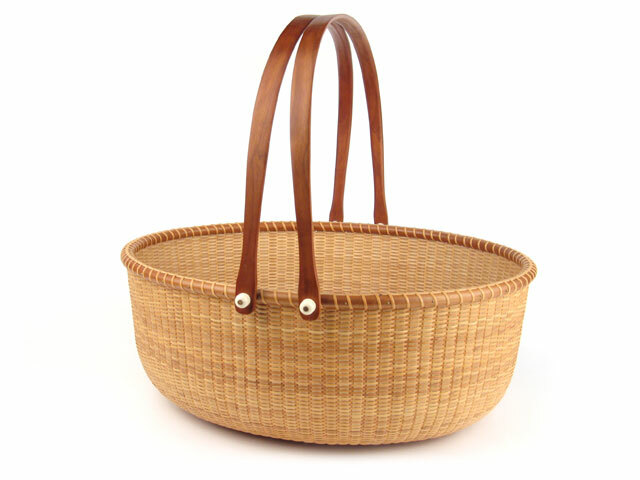 This was the first Nantucket-style basket I made in a class. I had made a number of Nantucket baskets before this, but had been working only from some instructions I had gotten from an Early American Life magazine. Needless to say the class was a real eye-opener. I made this basket in 1998 during one of my summer trips to New Hampshire. The class was taught by Lisa Thayer of Long Island, NY. I think the class was about three or maybe four days of steady work. I remember it took us all of one day just to get the staves shaped and inserted and just an inch or so woven. It took the remaining time to weave the body of the basket. The mold was so large that it was a lot of work just to reach around the 17 or 18 inch long staves to weave one stitch. The last day we installed the rims and about mid-day it started raining which provided just enough humidity to the air that the now glued rims were almost impossible to get on the basket. I can remember the relief when that outside rim finally slipped over the edge of the staves and I was able to squeeze it into place. I learned so much in the class that I called the woman who hosted my classes and scheduled to teach a Nantucket class. I came home with a set of 12 5" Nantucket molds and began teaching classes. I still have those molds, but unfortunately they have been sitting unused for classes for about 10 years. I guess I need to get back to teaching with those!